Thank you, thank you! 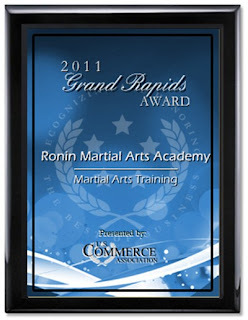 I am honored to have won this prestigious award! In receiving this recognition I would like to thank my mom and dad, all of my mentors and of course all of those people who train at our academy!! Hold on, wait one cotton pickin' minute... Before my I get too big for my britches, we should talk about something first. 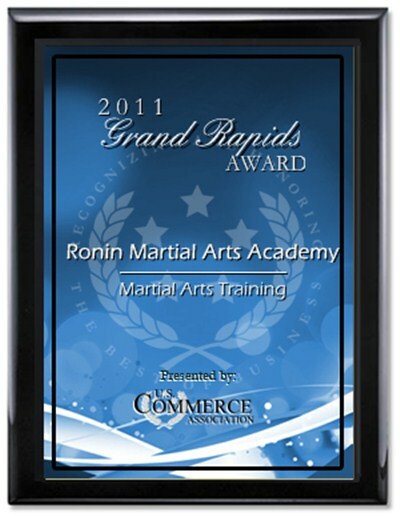 Who is the U.S. Commerce Association anyway and how did I win this so called award? Well if you google this official sounding association you'll find out very quickly that it is one big scam to get business owners to buy these bogus awards. Tricky tricky! So business owners beware of this scam to pilfer your pocket books! And as my grandad used to say, "Don't take any wooden nickles!" "The Stone Cutter of Notre Dame"
One day the foreman of a very large stone query was out doing his rounds checking on all of the workers who were cutting stone into bricks that were to be used in constructing the great Cathedral of Notre Dame. As he walked he came across one of the workers grumbling and very unhappy with life. The foreman asked the worker what he was doing? To which the worker replied, "What's am I doing?! Isn't it obvious? I am working out here in the hot sun cutting these huge stones into bricks. It's back breaking work. And look around, no matter how many rocks I finish there are more rocks to chisel. This project is so immense it will never be finished in my lifetime. It's endless! So, if you would excuse me I have to get back to work." Under normal circumstances the foreman would have fired the worker, but he had known this worker for a long time and knew he could be a bit cranky, however, he never missed a day and he did good work, so the foreman just smiled and agreed that carving stones into bricks was very hard work and kept moving. As the foreman walked along he came upon a second worker who was also carving stone. Because of the response of the first worker the foreman was hesitant to ask the second worker what he was doing, but being that was his job, he asked all the same. Upon hearing the question the second worker replied, "What am I doing? I am supporting my family. Although the work is difficult and very taxing, it supports me and those I love, so I am thankful for it. And because this project is so large there is job security which makes me feel safe in knowing I will be able to provide for myself and my family for my entire life." To this the foreman nodded and agreed on all of his points, knowing that each was true. Finally, before finishing his rounds the foreman came upon a third worker who was moving with conviction. Seeing his dedication the foreman asked him what he was doing? 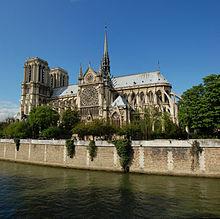 The third worker looked up from his work, brow red and sweating from the sun and replied, "I am carving the foundation to the great Cathedral of Notre Dame which will bring enlightenment, knowledge, and peace to many peoples lives for generations to come. I know that this project cannot be finished in my lifetime, which makes my job even more important. The efforts of others will be built upon my own, so you'll have to excuse me my friend for not chatting longer, but there is much work to do." The foreman was at loss for words as he thought about the connection that this laborer felt to his own work and how that drove him to excel in everything he did. He began to understand how powerful perspective and belief was in everything we do.The deeper connections to our daily lives is what keeps us on track and motivated to continue on. It makes for a more fulfilling and prosperous path. Live, Protect, Inspire & of course... Enjoy the Ride! Here is a good post entry I thought you would benefit from. Mushtaq Ali shares his "Twenty Rules of Silat Zulfikari." Although told in a lighthearted way, they are some seriously good principles of warriorship! Enjoy! "We are but a simple people." It is good to always remember that the point of the exercise is to deliver energy in the form of destabilize shock to one's opponent. This may be in the form of a strike with the hand, elbow, knee, or the whole planet. It may also be in the form of a strike with the mind, using words, body language and such, but in combat things need to be kept simple, so "I hit you". Not getting hit means that your structure is good, and it also means that you can absorb and shed the shock your opponent tries to give you. Not getting hit also means that your intent is to protect yourself. Rather than ruminating indecisively, deal with the situation. Do not be in denial about what is going on. Strike with the spirit, strike with the mind, strike with the body. While there is the obvious meaning to this statement, keeping your structure so that you protect and control "centerline" between you and your opponent, there is a deeper meaning to this. Centerline is where you define it. Own your whole space, utilize everything. A juru is a series of bio-mechanical exercises grouped together in a closed kinetic chain. They contain the motions and teach the principles from which technique can be spontaneously generated. Jurus become more useful when one learns to open the chain. Don't get stuck in thinking that rules are anything more than guidelines, know when to break the rules to your best advantage. Maintain good structure throughout your movement. Make sure that you are using proper power generation, don't give your opponent openings. Oh yes, and keep your elbows down. 9. If it goes physical, I WILL be the one who walks away. Keep your priorities straight. If you have to act, do so with commitment. Not protecting yourself from someone who is trying to hurt you is a sin against yourself. When you have to become physical, do so in a way that ends the confrontation in the quickest appropriate manner. Do not leave anything for later, don't win just this fight, win in such a way that you are not making future trouble for yourself. This could mean anything from NOT gloating over a victory to making sure your opponent knows that looking for a rematch is foolish. Use only the degree of force necessary to the situation. If you are dealing with a drunk friend who is just getting a little out of line, breaking his arm is usually not what is needed. If you are attacked by a man with a knife, acting as if this is not a life or death encounter will get you killed. 12. I am so dangerous I can afford to be polite, reasonable and mellow. Only the weak, the insecure and those who live in fear need to "woof" or show everyone how tough and dangerous they are. Always treat others with respect, strive to understand all points of view, never let yourself be controlled by negative emotion. 13. Gravity is my friend, on the other hand, it doesn't like you very much. Use gravity to help power your movement and make your work easier by being supple, help your opponent to work against gravity by making his structure more dense. When appropriate hit your opponent with the ground. 14. I not only have the right to think at all times, but the responsibility to do so. When you look around this planet, all the human problems you see may just be caused in large part by this one thing, giving over ones responsibility to think for themselves. If you're given the ability to do great damage to your fellows, then you MUST take responsibility and never let yourselves be controlled by unconscious memes. There is an old saying, "If you make yourself into a donkey, there will always be someone willing to ride you." 15. When it feels too easy, then I am doing it right. Good Silat is not about effort and strain, it is about integrating breath, movement and structure in such a way that what you do happens with an "effortless" flow. 16. Effective Silat means moving in four dimensions. While some martial arts rely on two dimensions, forward and back, right and left, good Silat will use all dimensions of space, changing levels, taking the most useful vectors in relation to the opponent. Good Silat also uses time. 17. The strongest lever is the screw. This is of course basic physics. 18. A screw moves circles through time and space. If you don't understand this you are not doing good Silat. 19. Make sure your opponent is 'Screwed'. Draw your opponent into the natural spirals of your movement. Use what the internal arts call "reeling silk energy", which is what is described in rule 18. Kebatinan means "inner" or "secret" teachings. This rule was first articulated when a student asked, "so when do we start learning the Kebatinan (secret stuff)" To which I replied "It's ALL Kebatinan". Silat Zulfikari hides all its "secrets" in plain sight, in other words, you learn the "secrets" from the beginning. There is enough mystery in a "simple" strike that you can spend your life exploring it and never reach the end of new discoveries.